Hope to see you there. I'm on row B. If you have an inferior seat we can swap, you deserve it for all the stuff I love reading on here !! I wont, alas, be there. I look forward to your account! lenhodge wrote: Hope to see you there. I'm on row B. If you have an inferior seat we can swap, you deserve it for all the stuff I love reading on here !! I'll be there. In row D. I'll give you a wave. who amongst us wouldn't LOVE a classic THE SMITHS track tonight? of these five; which would YOU pick? feel free to answer here yourself @ImposterSpeaks or onstage later! bronxapostle wrote: of these five; which would YOU pick? On the off-chance hell freezes over, my bet would be on "Still Ill" from their debut album. of course he is correct about "needing" the LP & as a fan from the get-go that was indeed lucky enough to see them thrice, of course STILL ILL ranks high on my list of faves too. but, i just can't see him singing it. the 5 i listed, i can however. anybody else want to chime in with a different song that they can imagine E & The Imposters tackling nicely? Was hoping to buy a ticket but seller didn't contact until it was too late for me to leave Birmingham ( and traffic reports heavy congestion for large part of the 90 mile journey) so staying at home with Mrs. Sulky and boxing up more stuff when I could be listening to one of the 10 recordings available from this tour so far. I'm hoping Steve (from Manchester) who recorded last year's show when my recording stopped halfway through, is going tonight so another recording will become available. Reel Around The Fountain must be in the running !! to answer BA. Incidentally Bruce was pretty scathing about Morrissey in The Big Wheel wasn't he ? sulky lad wrote: Reel Around The Fountain must be in the running !! to answer BA. Incidentally Bruce was pretty scathing about Morrissey in The Big Wheel wasn't he ? thanks for playing SULKY!!!! i LOVE your choice...that was the only DIFFERENT song they added to the setlist for night 2 at the Beacon in 1985! i am sorry you are NOT there. and, believe it or not, i have YET to acquire the book from Bruce! one day...i'll find it CHEAP! and wasn't E equally scathing once when Moz turned down the song he wrote for him (Poor Fractured Atlas)...something like: "he's been writing the same song for 20 years." I didn't know that about Poor Fractured Atlas, thanks for telling me about it. It actually would suit young Stephen M., now I think about it. That was a strange night. Strange, but memorable. The main set was bereft of the big hitting songs, which was fine by me. We got a huge chunk of Blood and Chocolate played, including an impromptu and very unrehearsed Battered Old Bird. Lots of slow stuff and a bit of a tendency for the wheel spinners to take over the show too much. 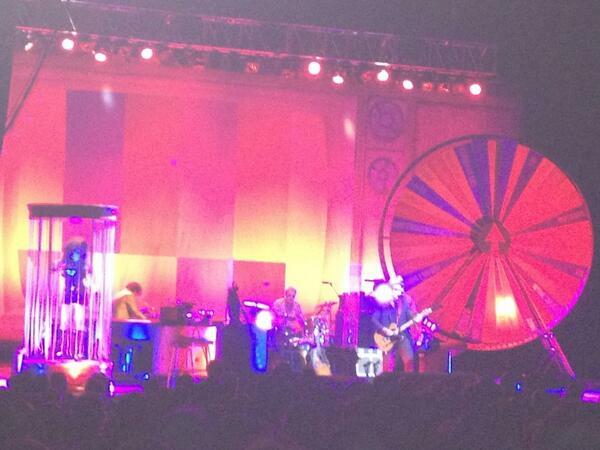 Then the wheel became pretty much redundant during the encores. The first one was a blistering greatest hits/ crowd pleasing adrenaline rush. The band were brilliant. I imagine that this will be what the Glastonbury set will be like. I hope so, anyway. Not content with that, he came back with Jimmie and Tramp The Dirt Down as a perfect counterpoint. That brought the well attended house down. A great evening. Not my favourite of the tour, Sheffield has that crown. Very enjoyable though. sulky lad wrote: I didn't know that about Poor Fractured Atlas, thanks for telling me about it. It actually would suit young Stephen M., now I think about it. yes Sulky, PFA would work PERFECTLY for Morrissey. i can't remember where i heard the original statement from him (was it at one of my shows?) maybe King Foyle will chime in about it. don't think i hallucinated it. and "Couldn't You Keep that to Yourself" was written for Madonna, if memory serves me well. Good setlist. Sulky will be gutted about missing some of those! I'm speechless! The variety of songs on this tour is mindboggling. We should do a count of the full list to compare with previous ones. I'm sure it's more diverse than last year's UK one. Yes, as mentioned, there's some B&C stuff here, but very excitingly also a liberal dose of IB and KOA. And my, pretty much, all-time fave Sleep of the Just was aired!!! And Still (if not Still Ill, BA!!). If only I'd been there. Am only praying now that he doesn't just use his 75 minutes at the Westport Festival for a more predictable greatest hits set and dives for some of these other pearls. We should do a count of the full list to compare with previous ones. Disappointing on the lack of variety of songs isn't it? I wonder if there'll be 100 different songs by the end of the tour. I'm hoping that as a tour finale they will play a whole set of chronological songs not played on the tour. 100 different songs were already done on the 10th in Liverpool! with six shows to go the question would be if there are 150 different ones! Sulky will be gutted about missing some of those!